Great news for all the developers out there! The brand new Ecwid API Platform has launched, enabling anyone to create an application for Ecwid. 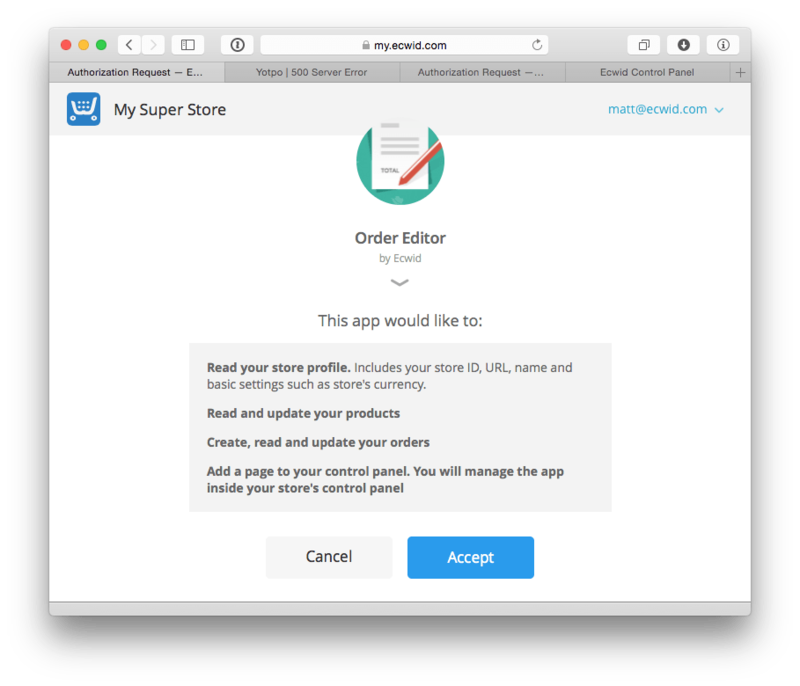 With the help of the new Ecwid API, third-party apps get the ability to manage all store data, add pages to the Ecwid Control panel, customize Ecwid storefronts on the fly, and much more. Some choose to use Ecwid’s default design for their storefront, while others customize the look and feel of their store to better fit their brand. Some install built-in Ecwid widgets, but others prefer to create custom store elements on their site. Some track their orders within the Ecwid Control Panel, and others export their orders from Ecwid and manage them in a third-party service. Ecwid is powerful and feature-rich, it covers nearly all of a small business’ needs. When there is a need to extend store functionality, the Ecwid API and third-party applications fill the gap. Ecwid has been providing a basic set of APIs for a long time and many Ecwid merchants are currently using them to customize their stores and connect to third-party services and applications. These include email marketing applications, custom payment gateways, affiliate marketing services, synchronization with external CRM systems, and so on. With this update, we launch a brand new Ecwid API platform. It is much more powerful and provides great opportunities for third-party application developers. Ecwid’s new API is a RESTful API with oAuth2 authentication. Any developer can use it to manage store data, add new interfaces to the Ecwid Control Panel, and even customize the storefront from an external application. The new API specs and documentation provide examples and even a playground tool, which is available here: http://api.ecwid.com. Below, we highlight some of the coolest API features. The application authorization is based on oAuth2. This makes your application installation flow smooth and seamless for the end user — a merchant just needs to allow your application to access their data and they are done. The process works much like the well-known Login with Google or Login with Facebook tools; no more copying and pasting API keys. Another great advantage of oAuth2 is the granularity of access control for a store’s data; the ability to manage the specific data an application needs and access permissions on a granular level are inherent with the Ecwid API. This helps you to be transparent about what merchant data you’re using and how you are using it, thereby increasing confidence in your application and enhancing the relationship with Ecwid merchants. How can I use it? Why should I? Ecwid has more than 600,000 registered users worldwide and the number is growing fast. This represents a huge opportunity to drive adoption and engage users with your service, whether it is a web/mobile application, custom development, or design service. Already have an application, that can help Ecwid users sell more efficiently? Go ahead and integrate it with Ecwid. We are more than happy to promote your application or service to make you and our users successful. Still looking for an idea for your application? Check out our ideas base (http://ideas.ecwid.com/) — a place where Ecwid merchants suggest and rate features they would like to have added to the product. Pick an idea, create an application and Ecwid can help you attract thousands of quality users. Here are the examples of applications that use the new Ecwid API. 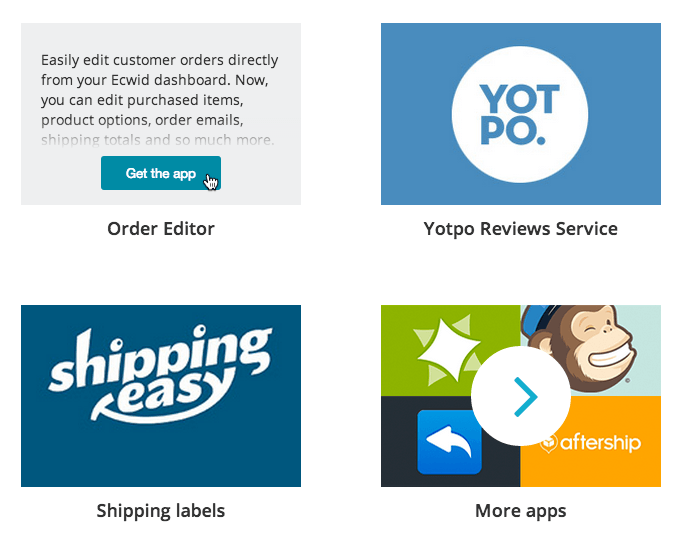 Order Editor allows merchants to edit their orders in the Ecwid Control Panel. Once installed, the application appears on the Sales page in the store backend and provides an interface for the merchant to easily find and edit any placed order in their store. Loyal2 provides a complete loyalty solution for card-based, stamp-and-collect, semi-virtual and fully online loyalty programs. It tracks sales and customers in your Ecwid store and automatically awards your loyal customers. Under the hood. 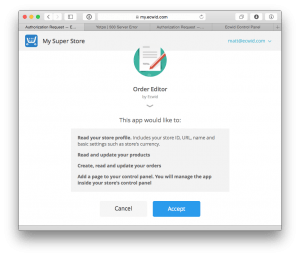 The Loyal2 app uses Ecwid’s Instant Order Notifications API to track orders in the store. It collects information about all orders and customers using /orders and /customers API endpoints to calculate and award the correct number of points for your customers. Loyal2 also automatically creates discount coupons in an Ecwid store using the /coupons endpoint — the minute that Loyal2 issues a reward voucher to a customer, they can use it in your store in the form of a discount coupon. Another great part of the new Ecwid API is the ability to bring about our new App Market. A new page with available applications is already in the merchant control panel. At the moment, it showcases a few select applications and provides short installation instructions. When the App Market matures and officially launches, Apps on this page will be categorized to allow merchants to easily find a service they need, install apps, and more. Not only does this give Ecwid merchants the ability to take advantage of the growing community of apps, extensions, and customized modules created using the new Ecwid API, but this also gives you, as a developer, the ability to get found quickly right inside the Ecwid merchant interface. More updates on Ecwid App Market will follow, stay tuned. The brand new Ecwid API enables any third-party developer to extend, modify and customize nearly every aspect of an Ecwid store. It’s now easier than ever to create an application for Ecwid and become a part of the upcoming Ecwid App market. Join the fun and start creating your app today!